On Christmas morning, greyhound advocates won a major victory when the Secret Life of Greyhound Puppies was restored by YouTube. This video documents the greyhound breeding industry as never before, and includes photographs that were taken by local officials, greyhound breeders, and owners, at facilities in Oklahoma, Kansas, Texas and West Virginia. This video is the first real glimpse into the secretive greyhound breeding industry, and shows puppies being tattooed at a few months of age, puppies kept outside with just small buildings for shelter, and breeding dogs enduring lives of confinement. The video was temporarily removed from YouTube earlier this month after a greyhound breeder filed a false copyright claim. We immediately responded to this claim, and asserted our fair use and free speech rights. Yesterday, our response was accepted and the video was fully restored. 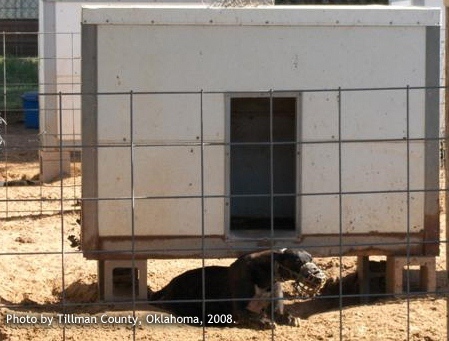 It shouldn't surprise anyone that greyhound breeders would go to extreme lengths to prevent the public from seeing how greyhounds live. However, GREY2K USA will not be deterred by these cynical tactics. I predicted that we would win this challenge when it was filed, and noted that we have won every such challenge we have faced. Please watch The Secret Life of Greyhound Puppies today, then forward it to everyone you know. Let's send dog race promoters a message that they cannot silence us, and we will continue to be a strong voice for the greyhounds. Treating any dog of any breed with cruelty and being inhumane should never be tolerated. I pray all cruelty ends in my lifetime. Peggy W.
It is very simple: why is this shame against our humanity, the brutal captivity of The Greys not stopped? Where is everybody? Why do the politicians not have any moral backbone? Is it GREED? Or those who want dogs to suffer?! What is wrong with people? How can they treat these gentle loving animals in such a way? I prey that this cruelty wil end soon and I will do everything in my limited power to bring this about. They are as bad as any Puppy Farmers in the UK Ireland etc They believe Greyhounds are property and not a living thinking animal just because they have four legs compared to the two of humans who are the worse disease this planet has to put up with. My wife and I have a wonderful gentle retired greyhound. He is sweet to know that this was his life at one time makes his being with us all the more precious and sweet. Boycot Greyhound Racing. If breeders keep mistreating these gorgeous natured dogs, race goers should stop going to the races and stop betting on racing dogs. While Greys actually in work ar treated well as athlete's should be, the breeding farms ( no better than other puppy mills) have a lot to answer for. The next thing Greys need is protoction after their racing careers have ended. It's no wonder cruelty rages today; there is no respect for life, be it animal or human. We need to continue to speak up because it certainly isn't going to happen in the political world.